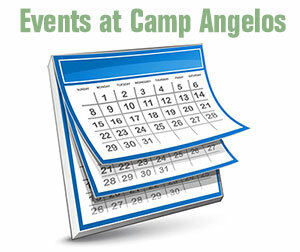 Camp Angelos is the perfect venue for weddings, camps, retreats, conferences, fundraisers, reunions, school dances, and outdoor school. Camp Angelos lies along the Sandy River on 75 scenic acres in Corbett, Oregon, only a 30-minute drive from Portland. This excellent setting offers the opportunity to experience the essential natural qualities that are the heart of Oregon. Within this environment, the camp provides the optimum in facilities: comfortable cabins, modern bathhouse facilities, first aid station, and a magnificent lodge at the hub of it all. Hiking trails, a campfire area, playing fields, stocked trout ponds, and the splendid Sandy River combine in a natural setting that makes Camp Angelos a truly special venue for your next event.